At Allendale it seems young children are everywhere. Four-year-olds in the state pre-K program are playing with measuring cups and dried rice at a “sensory table.” Five-year-olds in transitional kindergarten are getting books to take home to read with their families. Three-year-olds who are recent immigrants from Yemen and Afghanistan are playing puzzles and toys while their parents attend English as a Second Language classes down the hall. And in a sunny classroom, a group of toddlers, their baby siblings, and their caregivers sit in a big circle and sing songs in English and Spanish as part of a weekly playgroup hosted here. Bringing programming for young children into the elementary school helps build community, continuity and instructional alignment, and helps children and their families see school as a welcoming place. “I have kids who are now entering kindergarten who have been cruising the hallways here for a couple of years as toddlers,” said Miller. These programs help young children learn foundational skills to help them get ready for learning in the upper grades—early mathematics and reading skills, language development, appropriate expectations of behavior, self-regulation, and social and emotional skills such as sharing and expressing feelings. As part of this work, Allendale has partnered with Lotus Bloom, a family resource center to bring playgroups to the school on weekday mornings. This partnership was made possible with local philanthropic support. Ajhana Deramous and her 20-month-old daughter. 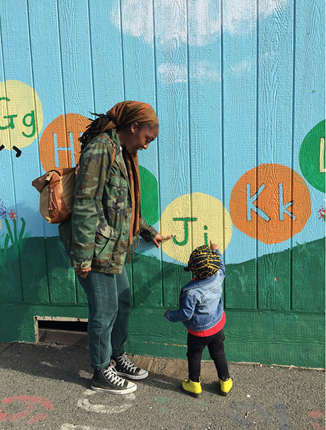 As we talk, Deramous’s daughter, Aziyah, is climbing on the play structure and running back forth pointing to letters that have been painted in a colorful mural on a nearby wall. “You found a J,” her mom says. Aziyah’s grandma lives around the block and the two combine visits with grandma to visits to the playgroup. Deramous says she’s happy her daughter feels comfortable here, so when she’s ready to go elementary school it won’t be a foreign place. Lotus Bloom leads playgroups two mornings a week at Allendale. The playgroups provide a welcoming space for low-income, multicultural families with young children to play and learn, and focus on supporting parents and caregivers with workshops and introductions to community resources. According to Lotus Bloom’s executive director, Angela Louie Howard, the model also aims to lift up and support knowledge about child rearing that is embedded in Oakland’s ethnic communities and empower parents. Howard has been working with the Oakland Unified School District to help increase its early childhood programming and provide culturally competent support programs for parents and caregivers of very young children before they get to kindergarten. Close partnerships like these are an important part of Oakland’s recent efforts to reform the system of care for its youngest children and to better integrate early childhood programming into elementary schools. In Oakland, it is common for child development centers to operate as separate entities and not be integrated into the school culture or activities, even though they are often on or adjacent to elementary school campuses. Through partnerships and private foundation support, Allendale also provides wrap-around services for students and families, including counseling and support services, onsite dental and medical services for students, and intervention programs that promote positive behavior. Logistically, sharing the school with so many groups can be challenging. For example, making sure two-year-olds are able to safely share the play yard with 11-year-olds. But Principal Miller says despite the challenges, integration is worth it. “I play musical chairs a lot,”’ he says, “finding enough space is always an issue.” But his unified vision of early education and elementary school he hopes will pay off down the line.